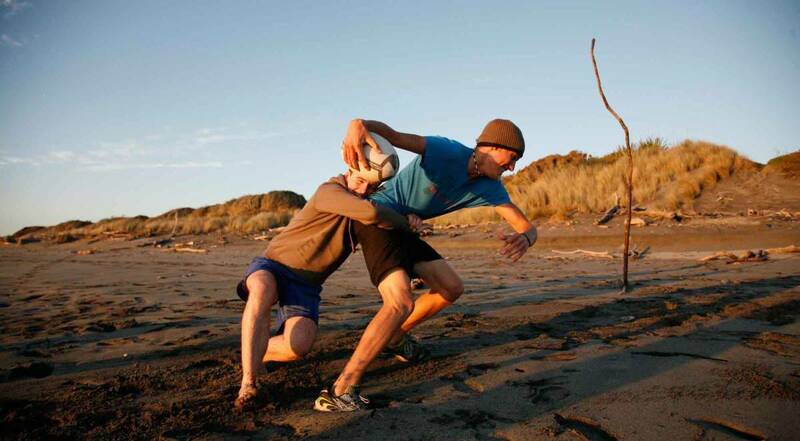 For rugby fans worldwide, a trip to New Zealand is a must do! 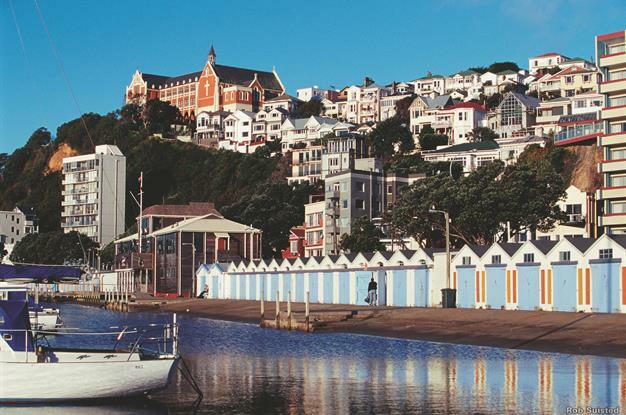 Home of the All Blacks, this picturesque country has a proud rugby history. Whether you’re visiting for the 2017 rugby tour of New Zealand, or planning an adventure holiday, we’ve mapped out the ultimate campervan itinerary around the North Island. Over three weeks, visit scenic highlights, interspersed with test matches, adrenaline-fueled activities and a visit to the New Zealand Rugby Museum. Campervan parking will be limited in Auckland during the tour so if you have not booked a place to stay we strongly recommend that you do. Alexandra Park has opened their facilities especially for the Lions Tour Supporters. More information and how to book can be found here. Auckland Racing Club has also partnered with Auckland Tourism Events & Economic Development to deliver a pop-up campervan park on set nights between June 5-July10. For more information and how to book, visit the Ellerslie Event Centre website . You can also find out more about the Auckland Fanzones & Fan Trail on the ATEED website here. 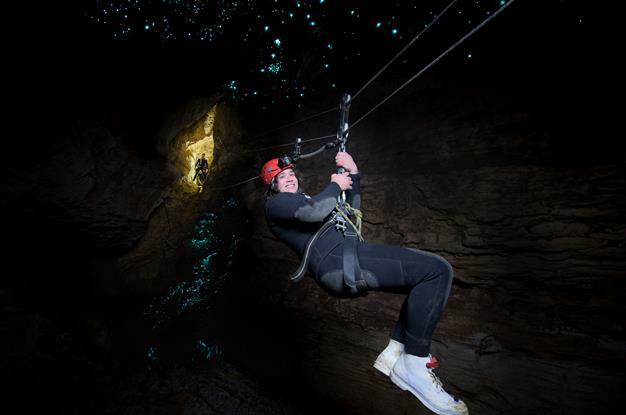 Visit the Waitomo Glowworm Caves or try out the exhilarating Black Water Rafting. You can explore Waitomo’s three caves: Waitomo, Ruakuri or Aranui and their magical living light displays. On your second day, movie fans must pay a visit to Hobbiton. Perfect for families too, as this attraction is unbelievably charming for people of all ages. The picturesque village is a permanent fixture of the landscape and a highlight for tourists to the area. Spend the night in Tauranga – a playground for lovers of watersports. Join your fellow Lions fans at the Lions Supporter Village before cheering on The British & Irish Lions against New Zealand in the first test at Eden Park in Auckland. Head south-east again to New Zealand’s lively geothermal centre, Rotorua. Don’t miss Wai-O-Tapu Thermal Wonderland where you can get a front-row seat for a geyser eruption as well as seeing colourful geothermal pools and bubbling boiling mud. The next day, visit Tamaki Maori Village for a cultural education and an unrivalled tour through Maori traditions set in an ancient forest. For the truly adventurous, try a tandem skydive when you’re in Taupo and take in a bird’s-eye view of this beautiful region! Immerse yourself in rugby history with a visit to the New Zealand Rugby Museum in Palmerston North, a great one for the kids and fully grown rugby fans alike. Enjoy the second test at Westpac Stadium in Wellington. Enjoy a cultural day visiting some of the many museums and galleries or theatre shows on offer in New Zealand’s capital. Napier is frozen in time as a symbol of the 1930s love affair with Art Deco architecture. Enjoy a stroll through the main streets to enjoy this sunny town and then spend the night beachside. Ohope Beach was voted New Zealand’s Most Loved Beach by a nationwide AA travel poll, so this is a dreamy destination to park up for the night. Check out the new Gold Discovery Centre in Waihi and take an exciting tour ‘inside the fence’ of the Martha Mine to see the monumental process of gold and silver extraction up close. 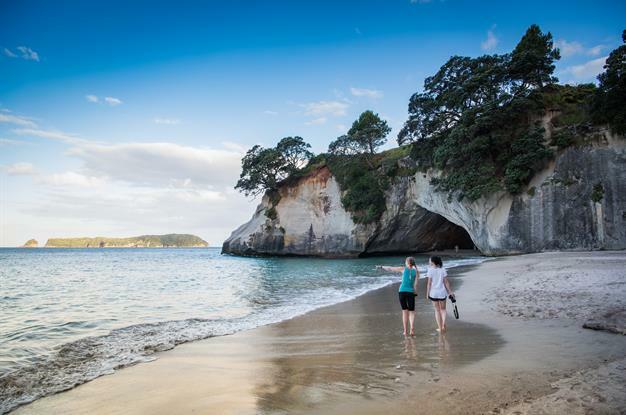 Cathedral Cove is an iconic spot that makes an unbeatable photo opportunity – not to be missed! Then pick up a shovel and head to Hot Water Beach at low-tide where you can dig yourself your own personal hot pool. This is where you’ll find New Zealand for your Instagram feed: misty forests, pristine beaches and hundreds of hideaways for a quiet escape from the hustle and bustle. If you’re in need of a little more pampering, visit the Miranda Hot Springs and relax in the thermally heated mineral water pools. Travel back to Auckland via Kawakawa Bay to enjoy a short walking track with beautiful views before getting ready for the final test of the tour and then venturing into Northland! If you’re a beer lover, or simply a fan of good music, pay a visit to Brauhaus Frings in Whangarei. Alternatively, check out the restaurants along the marina or shop for souvenirs from the local craft shops. A vigorous walk in the great outdoors is always good – even better when there’s an incredible 360-degree view waiting for you at the summit. Check out Flagstaff Hill – there’s a 2.5km walking track loop from the town centre. Then take the ferry across to Paihia for some snorkelling among the colourful sea life. It’s a fair drive back to Auckland, so stopping in Dargaville can break up the distance. It’s still quite a drive, though, so be prepared. If you have time, explore the Kauri Coast for an encounter with the world’s oldest and largest kauri trees.